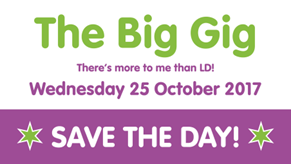 The Big Gig – There’s more to me than LD! The Big Gig is an inclusive free event celebrating the good work with and for people with learning disabilities. For several years people involved in learning disability have met at Locality Meetings to talk about issues that are important to them. The people attending these groups suggested that we hold an event for everyone in East Sussex – so that is what we are doing! The Involvement Matters Team – a group of adults with a learning disability – work with East Sussex County Council to ensure the views of people with a learning disability are heard. They have been running a campaign called ‘There’s more to me than LD’ to raise awareness that having a learning disability is part of who you are, but not the only part. This campaign is the theme of The Big Gig and campaign films can be seen here. The Big Gig will have a range of stands to provide information and share knowledge; performances to entertain and activities to take part in. Among others, those who have confirmed they will be there are: Sussex Cricket, Active Hastings, Wheels for All, Delta7, Hastings Mencap Open Door, The Boathouse Singing & Signing Choir, ESCC LD services, Culture Shift, Seeability, One You East Sussex. The list goes on. Whether you are a person with a learning disability, a carer, a provider or someone from the wider community, this event offers something for everyone. There will be information, activities, film, live music and much more.